The Santa Barbara International PuppetPalooza 2018 is March 1-4, but the festivities will kick off in January with the opening of PuppetPalooza Central — Museum and Theatre near center court at Paseo Nuevo in downtown Santa Barbara. PuppetPalooza Central opens Monday, Jan. 22, and runs through March 15. The dedicated festival headquarters will sell festival tickets and merchandise, and present an exhibit of puppetry art by one of the Santa Barbara’s foremost puppet builders. Also, in the weeks leading up to the festival, PuppetPalooza Central will screen puppet films curated by Heather Henson, daughter of Muppets creator Jim Henson. “We are excited to be a part of this inaugural festival bringing such a unique and fun experience to Paseo Nuevo," said Kristen Weidemann, general manager of Paseo Nuevo Shops & Restaurant. "PuppetPalooza Central will be a great addition to the entertainment options for children and adults," she said. "We are looking forward to supporting their lineup of events and programs that will showcase puppeteers, artists and films and sharing this art form with our community and visitors,” Weidemann said. The fundraiser will honor Santa Barbara anchorman John Palminteri and the entire KEYT News Channel 3 team for going above and beyond with their coverage of the Thomas Fire and aftermath in Santa Barbara County, PuppetPalooza officials said. At the event, PuppetPalooza will unveil as a tribute a John Palminteri Puppet that will perform live with Palminteri. In addition to showcasing the puppetry attractions coming to PuppetPalooza, guests can enjoy live performances, and have the chance to meet festival leaders and sponsors. Light bites and beverages will be served. “We hope our joyous festival filled with music, puppets, families and fun can bring renewed hope and laughter to our entire community after a winter season that has been difficult for everyone and tragic for too many,” said festival creator Mitchell Kriegman. “Honoring those in our community who have been reporting about our tireless first responders and informing all of us about these pressing events seemed like the best way to kick off our festival," he said. "In opening a center devoted to the art of puppetry and film in the heart of Santa Barbara’s shopping district, we hope to contribute to enhancing Santa Barbara as a destination good for business and commerce," he said. "It’s about the arts, but also multi-culturalism, mental health and families,” Kriegman said. Featured at the fundraiser, and on display throughout the season at PuppetPalooza Central, is local puppeteer Christina McCarthy and her handcrafted puppets. McCarthy is a master at inventing new ways to make puppets move like real creatures, PuppetPalooza officials said. As vice chair and director of dance at the UCSB Theater and Dance Department, McCarthy spends her time creating three-dimensional art to tell a story in the body and the intersection of puppets, theater and dance. PuppetPalooza Central also will show the regional debut screenings of Handmade Puppet Dreams presented by Heather Henson. Handmade Puppet Dreams is a traveling film series that promotes independent artists exploring their handmade craft specifically for the screen. The films focus on real-time puppetry, and allow artists to build their vision, then breathe life into their dreams. With this series, Henson has set out to showcase a new generation of puppeteers and puppet artists who embrace film as a medium for artistic expression. Tickets to the PuppetPalooza fundraiser are $25 and are available for purchase at PuppetPalooza Central in Paseo Nuevo, 301 Paseo Nuevo. The festival said it is looking for additional community support to reach its final funding goals. Those unable to attend, but who would like to donate or become a festival sponsor, can contact info@puppetpaloozasb.com or call 316-0348. For full festival details and a schedule of events, visit puppetpaloozasb.com. 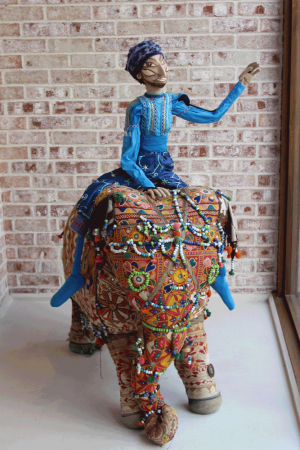 — Jennifer Zacharias for the Santa Barbara International PuppetPalooza.